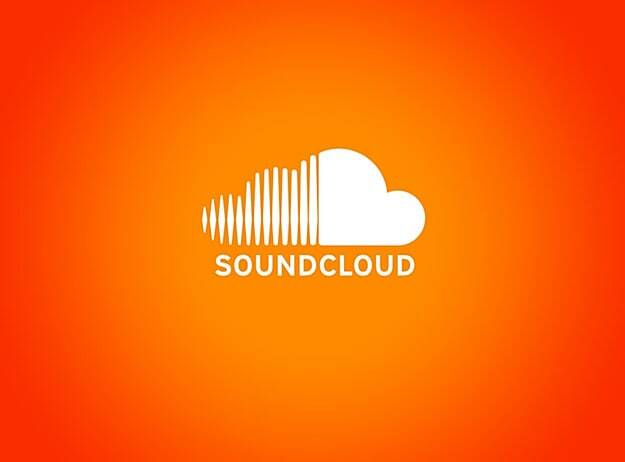 Back in February, I penned a speculative article in regards to SoundCloud&apos;s interesting choices in venture capitalist partnership, and a comment was left by someone that said my opinion "proves that you have absolutely no understanding of how the SoundCloud business model works or how venture capital works and should be prefaced as wild conjecture." Obvious political and strategic moves were made alongside a series of partnerships with companies that have the ability to cross-pollinate all social media platforms and mine your data for profit, but we&apos;re apparently just bloggers that have no idea how the real world works. Though there was a lack of concrete evidence to back our claims, the writing was on the wall, and all we had to do was sit back and wait. 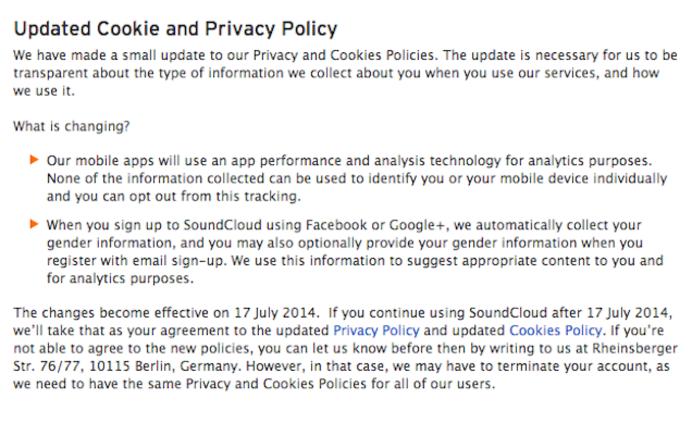 As it turns out, all you have to do is read a little bit and connect dots to stay months ahead of economists, and SoundCloud&apos;s new policy for cookies spells out exactly what we speculated. In a nutshell, the new guidelines state that you will start being tracked as of next month, your information will automatically be collected if your account is hinged to Facebook or Google+, and that you need to send a handwritten letter to Germany to opt out, but refusing to comply may result in termination of your account. It confirms our assumptions, and hints further at SoundCloud aiming to monetize or sell in the coming months. This announcement came quietly in a single notification that I haven&apos;t seen since it popped up on my home page a couple of weeks ago, and has since eclipsed by the release of their new mobile app, which has been met with mixed reviews. The most interesting move, though, is one that nobody is really speaking on–and it&apos;s the most frightening. SoundCloud seems to have given Universal the keys to the car within the last month, and is allowing the media giant full access to flag accounts&apos; records without any communication whatsoever with SoundCloud. We&apos;ve seen an insane wave of song removals, copyright notifications, and account terminations on behalf of SoundCloud in the past month, but seeing that majors now have back end access to systematically scrape all of their content without having to answer to anyone is crazy. 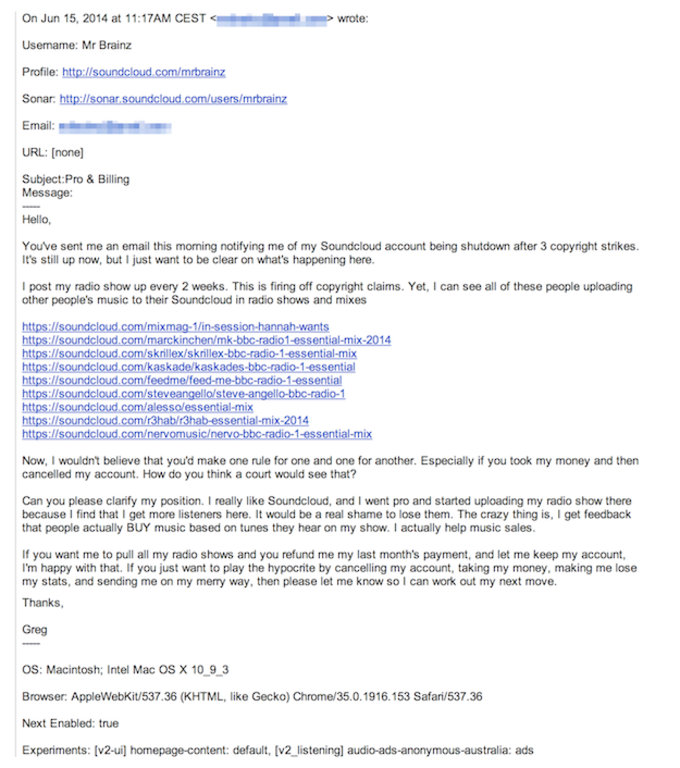 Below are a series of emails to and from SubFM DJ Mr. Brainz, who had his account flagged directly by Universal with no involvement from SoundCloud at all. The question posed by Mr. Brainz warrants discussion. Is a BBC mix somehow more important? Are heavily-trafficked accounts less likely for a major to flag? Are majors going to tiptoe around big acts and chop away at the novice musician until they control SoundCloud? 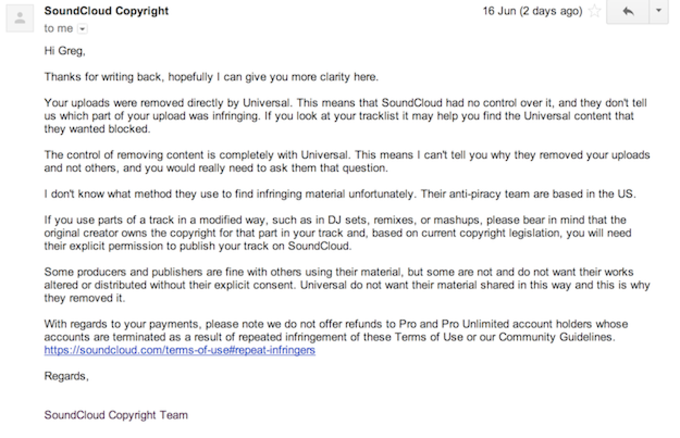 We&apos;re also curious what Universal&apos;s issue is with SoundCloud, and we&apos;re scratching our heads as Warner, Interscope, and Atlantic are using Soundcloud heavily, and Universal seems to have a hands-off policy with the platform. The most notable account strikes in recent weeks were against Kaskade, who complained publicly and now claims the ball is already rolling to start his own music platform. 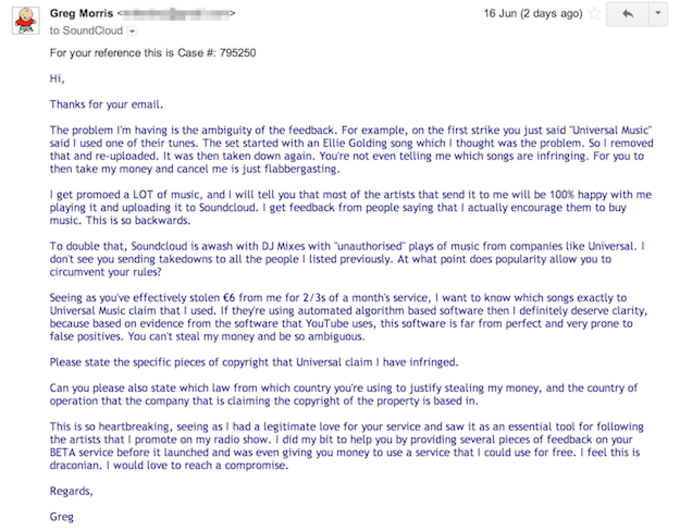 We&apos;re curious about what the next step is for musicians that are fed up with corporations killing their vibe.